Discover the truffle that Bloomberg Pursuits declared "The Best Chocolate Truffle in the World!" and raved “The tender coating gave way to a luxurious whipped filling with layers of flavors. The box itself was gorgeous – you know when you look at it that you’re getting something special.” 16 silky-smooth classic chocolate truffles. Ttl Nt Wt 6.88 oz. 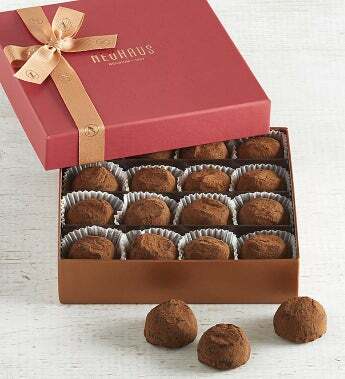 Contains 12 pieces of Neuhaus Classic Truffles in a Prestige box with a ribbon. Gift Measures 6" x 6" x 1.5"